On November 23rd, the German heavy metal legends ACCEPT will release Symphonic Terror – Live at Wacken 2017. They are experiencing more success than ever, having hit their stride creatively! In the 10th year since the band's reunion, the quintet can look back on four top 10 albums in Germany, including an unbelievable #1 with Blind Rage (2014) and a brilliant #3 with their latest album The Rise Of Chaos (2017). 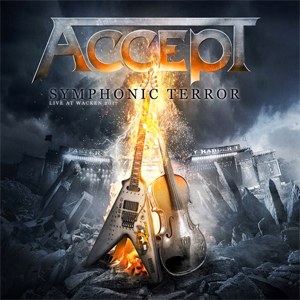 Today, ACCEPT release a live video for "Symphony No.40" the b-side of the 10" single "Balls To The Wall", watch the video on KNAC.COM HERE. "Double Cello Concerto in G Minor"
"Symphony No. 40 in G Minor"
What started as a world premiere in Wacken and caused quite a stir worldwide (thanks to the live streams) will be continued in early 2019. This means: ACCEPT are planning to tour across Europe with an orchestra in Spring 2019! "I really hope we will be able to fulfill our dream - we are working hard on it!" tells Wolf Hoffmann with eager anticipation. "What I can already say now is that there will be lots of optical and musical surprises, that fans of ACCEPT have never experienced before. We want to multiply what we have achieved in Wacken and are happy about every bit of support we get. One thing is for sure: 2019 will be exciting!"